74 arrived 2 minutes ago. Number 65 arrived in Glasgow yesterday. Great watch, packaging and straps. Number 79 now on my wrist in Rainham, Kent. Last edited by Chris W; 1st November 2013 at 20:58. #003 is here with me, south-east London. My first diver. I don't think I'll need another. #76 surfaced in CR6 today. I asked for #69 and its in West Oxfordshire. Love it. #20 arrived in sunny Portland, Oregon last week. Great watch! # 82 made it safely to Lyngby Denmark! First of all congrats on your pickup and getting in on the first run, mine is on the way and will be delivered if all goes well this coming Monday, I'm like what are the chances of two from a not really huge city watching the same site and purchasing the same watch. It is a stunner isn't it, I can hardly wait and if it is as nice as everyone says could be my last for a good long time. Might sound weird but I'm going through some kind of burnout period right now I actually have an OWC and was interested in a Halios Tropik and then this came along and trumped the both of them so ..... don't have money for all three nor would that much money laying around not getting used so I'm thinking I will enjoy this one for a quite a while. Number 73 safely on my wrist. Lovely watch, one of those watches that will look right in any setting. All updated as of post #66! Number 64 with me in North Kent. nice watch and nice size for smallish wrists. No, it could be 63, I'm picking up my new glasses today. ok thanks - i photographed the back on my phone and expanded it ... looked more like 63 as 3 was 'open' on LHS, card said 68.
even with vari focals - could not make it out by just my eyesight. Well gents # 2 has arrived safe and sound in Portland, Oregon USA, have yet to gaze upon it as the misses might want me to keep as a Christmas gift from her to me.... will see about that : ) And my thanks to Sir Eddie for excellent everything from product, to communication to delivery to what I'm sure (once I see it) will be an fine piece of artonthewrist. No 85 arrived in Singapore yesterday and on the wrist now! I knew the PRS-82 would be popular but it has now become the fastest selling watch in Time Factors history. I know the first 50 of the Speedbird III sold out in a few minutes but the PRS-82 has sold 124 in just 3 days of opening. The PRS-68 sold 108 in the same time. It looks fantastic and I think the size broadens the appeal - big enough to look modern but not too big to scare off people with more delicate wrists than mine. Oozes quality, is a billy bargain at the price for me. and I think the size broadens the appeal - big enough to look modern but not too big to scare off people with more delicate wrists than mine. Oozes quality, is a billy bargain at the price for me. Couldn't agree more. The price was lower than I expected and the size is reasonable by modern standards. The choice of watches for those of us with modest wrists is becoming increasingly limited and the Swiss seem intent on making everything so expensive, so when a watch hits the bullseye size and price wise its a no brainer. Its a cracking watch that looks better in the flesh than any picture. I think there is a real niche for 40mm ish good quality, well styled modern watches. Most modern divers style watches seem to be 42-45mm+ , and if from a Swiss manufacturer .. can be around 2000 - 2500 GBP with an ETA movement , and are NOT actually very exclusive. 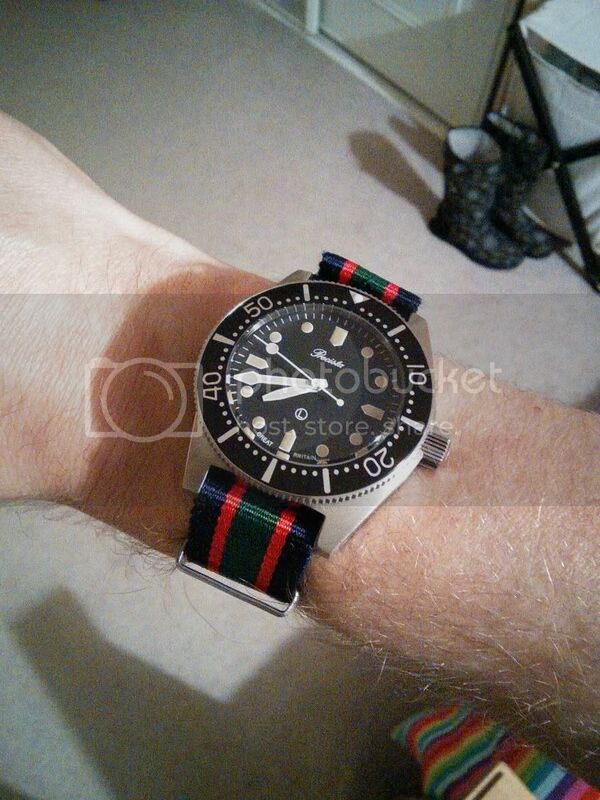 I have been looking for a new watch for a while ... was looking at Tudor black bays and Pelagos ... which are both very nice, but a bit pricy considering ETA / bought in movements .. and are at the upper end of wearable size for someone with 6.75 inch wrists like me. Last edited by alfaman; 6th November 2013 at 04:50.
the Swiss seem intent on making everything so expensive, so when a watch hits the bullseye size and price wise its a no brainer. I agree 100% -- looked for a watch for a whole YEAR until the PRS-82 came along. Prs-82 #100 (as requested) is here. Thank you Eddie. 24 hours from the order to my desk in Milan, excellent. P.S. : at last a nice watch fit for medium size wrists. Last edited by Gatt; 6th November 2013 at 10:20. Last edited by Gatt; 8th November 2013 at 07:12. N°70 for me, arrived this tuesday ! PS the card says 13070089, so I am assuming this means warch 89? Last edited by bhall41; 8th November 2013 at 01:04. That number will also be on the caseback. Correct....as Cannop states, the same number will be on the caseback. All caught up on updates - welcome everybody, thanks for contributing your info. Trivia question: where in the world would be FURTHER from Sheffield than #89 (Melbourne) ? Last edited by redhed18; 10th November 2013 at 05:36. No. 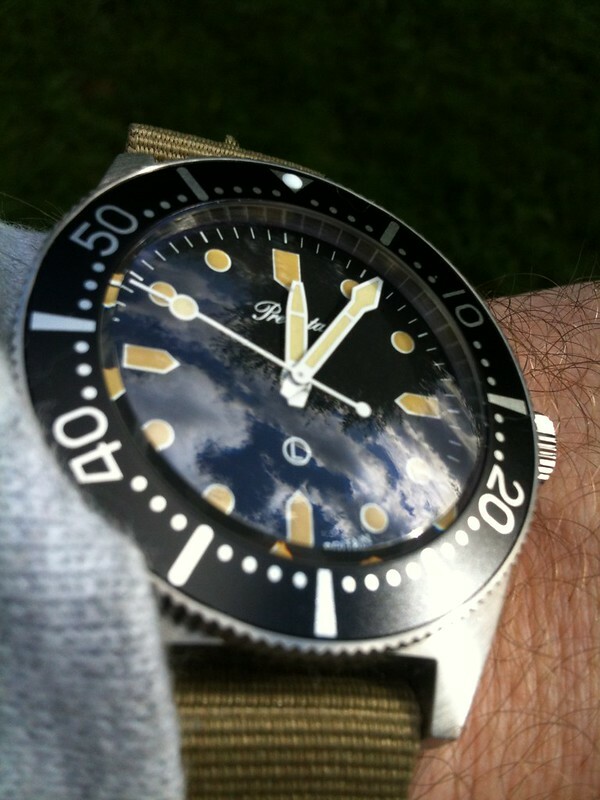 83 is now residing in a South Devon; wasn't sure on the rubber, love it on a NATO! #117 sitting comfortably on my wrist, here in Rye, Colorado. Love it! I will post some pics and some thoughts when I have a bit more time. Thanks, Time Factors. I couldn't be more happy (aside from maybe not having to pay $45 to the UPS man, but that's no fault to TF). My first Precista watch and what a beauty. Very striking and comfortable. Number 123 arrived in sunny Norwich and sitting on wrist. I have no 132 residing in Swindon! Last edited by nibby; 19th November 2013 at 20:37. You will be pleased to know that the following items from your order RC15208*** have been despatched.